Where are breast augmentations performed? Through the years, I’ve gotten to know scores of people who work in the OR – anesthesiologists, nurses, technicians, etc. It feels like a family; some people have worked together for as long as 30 years. We celebrate birthdays, marriages, and retirements. I’ve seen that the concern for each other translates into concern for each patient. I’ve worked with people from Korea, India, Italy, the Philippines, Russia and Peru and learned about their cultures – along with several words in their languages. (You might not be surprised to know that one of the words I learned is “breasts”!) One of my co-workers is an accomplished painter; his paintings are hanging in my office and in my home. I appreciate the hospital’s high standards. The administration reviews each surgeon’s credentials and training and requires board certification as a prerequisite for joining the staff. Nurses and staff participate in weekly in-service trainings and must earn continuing medical education credits to maintain their licensure. I work with talented, competent and sensitive colleagues, and we enjoy exchanging ideas, discussing the latest medical research, and sharing suggestions to improve the patient experience. Every nurse and assistant in the OR is cross-trained and experienced with cosmetic breast surgery, so they can fill in and support each other. The hospital offers great support – like a good bra! Patients get a blood test for pregnancy as part of their presurgical testing, but if the test needs to be repeated the morning of surgery, we can get it done and have the results back in minutes. If a patient tells me she smoked weed before she came in for surgery, the anesthesiologist is on hand to decide whether or not it’s safe to have surgery. There is ample staff, and they will sleep over in bad weather if necessary. The hospital never closes; in the event of a power failure, they have generators. Dr. E. in the OR. Although complications are rare, surgicenters must have a plan in place to transfer patients to a hospital in the event of unanticipated medical complications. It’s comforting to me to know that the hospital’s emergency room is just an elevator ride away. I think of it like homeowner’s insurance. You hope there’s no emergency, like a fire or a flood, but if there is, you’re glad you have protection. While some surgicenters might argue that they are cleaner than a hospital, it ain’t necessarily so. The hospital undergoes regular inspections and is held to strict standards by state regulators. Breast augmentation surgery does not require an overnight stay; patients go from the short-procedure unit to the OR to the recovery room to the post-op lounge – all on the same floor. Across the country, infection occurs in less than 1 percent of breast augmentation patients. 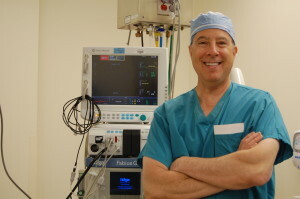 In the more than 5,000 women I’ve taken care of, only 2 have developed an infection, and 1 of those was operated on in a surgicenter earlier in my career. My patients confirm my feelings about Nazareth Hospital. We conduct a survey post-op in which the patients get a chance to evaluate the hospital staff. They consistently rate them 10 out of 10. Likewise, a number of patients have been nurses who are employed at other hospitals; they routinely comment that their experience exceeded their expectations.